The lesson of the HSBC debacle is not merely that tax evaders must be hunted down much more relentlessly, but that in its present form it’s ungovernable. It’s no good saying HSBC was run in a ‘federated way’, but now management has been tightened up (is anybody really taken in by that anyway?). We were told that in 2012 when the HSBC Mexican bank was found guilty of money laundering for pariah states, drug cartels and big mafia crime syndicates, but 3 years later the same charges have erupted elsewhere. A senior US Department of Justice official got it right when he said that HSBC’s culture was “pervasively polluted”. The truth is that HSBC, once a cautious and conservative organisation, was derailed in the late 1990s by its chairman Sir John Bond into a huge overseas buying spree to satisfy the board’s ambition to turn it into a global empire. Any idea of serving the interests of Britain was pushed to the margins and the empire-building avarice of Bond took over and went wild. What is a bank for? Its function should be as an intermediary bringing together the savings of depositors and allocating them judiciously for well-chosen productive investments. However under the influence of the ideology of unalloyed market power exalted by neoliberal capitalism over the last three decades, the banks have taken on the role of corporate expansion and profit maximization in their own right. Overwhelmingly bank lending has been shifted towards overseas speculation, devising and promoting of artificial tax evasion and avoidance schemes, buying and selling of prime property particularly in central London, and the invention and marketing of exotic financial derivatives. Only a shockingly small 8% of UK bank lending was allocated to productive investment in the British economy. This perversion of the proper role of banks was aimed to satisfy the desires of the super-rich (euphemistically described as ‘high net worth individuals’) because that is where it was perceived that the biggest profits lay – and, though this was played down, the biggest risks. The latter is exactly what happened with HSBC’s purchase for £9bn in 2003 of Household, a US sub-prime lender that went bust in 2006, the purchase in 2002 of the Mexican bank that allowed Mexican and Colombian drug cartels to launder nearly $1bn through HSBC, and then HSBC’s Swiss bank providing a no-questions-asked cash machine for super-rich tax evaders and avoiders. So what should be done? The neoliberal business model for banks has irretrievably broken down. There is no question but that HSBC should be broken up. We need smaller banks targeted on the real needs of the British economy, and if the private sector cannot deliver this, the big banks should be taken into public ownership. Also, accountability has completely collapsed in the financial sector, as the depredations of Bond and Green clearly reveal. The closed circle of City of London insiders, largely from the same class and the same universities, also needs to be broken up. I will return to that on another day. 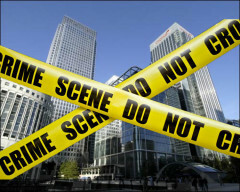 Why are US, France & Belgium starting prosecution against HSBC but not the UK? Posted in: Conservatives, Finance, Politics. Yes and apparently according to The Guardian the HSBC Swiss bank was home to the likes of Papa Doc Duvalier who nicked £300m from the people of Haiti – one of the poorest countries on Earth! Apparently global tax evasion is 3 trillion dollars a year which we could use to serve humanity and to address global poverty. New Internationalist estimates that the the rich have stashed 22 trillion dollars in illicit offshore bank accounts – I would argue TO AVOID GIVING TO SOCIETY – perish the thought that the rich pay their fair share contributing towards global health services, education, looking after older people etc.etc. Which is why I argue the rich and powerful are the true little people of the planet! Michael is right – should take some banks into democratic public ownership – could let staff elect the boards and give customers and the community a say. Should massively tax the £3b bankers bonuses and I have always argued for a 5% EC Financial Tranaction Tax (not the piddling 0.1% Robin Hood Tax) – this would bring in £1.75tr in the EC to address austerity and wipe out all the debts – could make this global to make the financial sector pay for the mess THEY caused! We should also take £1b each from the top 200 companies in Windfall Taxes – it is our labour which creates the wealth and makes societies work – then productive long-term investment here we go – for example we could make toilets for the 2.5b human beings that don’t have access to them. The solution to the global economic crisis is to meet global human need and we need to work with sister democratic socialist parties Worldwide to make common cause. I can think of many industries and the global community which would benefit from democratic public ownership – mail, rail, pharma, public utilities – again staff elect boards and communities have a say but because we are not about greed and profit maximisation with imagination we can offer a better service – some publicly owned airlines for example could have less seats, more space for passengers and crèches in the sky! Yours in hope and solidarity! This means breaking up Barclays as well as HSBC, along with the two bailed out banks, RBS and Lloyds. There has, as far as I can tell, been no reaction to this from the banks or big business generally, presumably because they understand how popular such a policy would be, made more so by the Barclays Libor scandal and the recent HSBC revelations. Such policies will be crucial to Labour’s getting the economy back on a sound footing. It was the size of the banks, ‘too big to fail’ that necessitated the huge bail outs from the taxpayer, and this is the way to ensure that this never happens again.